Before hitting the golf course, golfers must choose their equipment wisely. Not only must they choose the right clubs, but they must also think about how they plan to lug around all of their equipment. Sure, motorized golf carts are usually available for rental at the course, but they can be costly and complicated to operate. 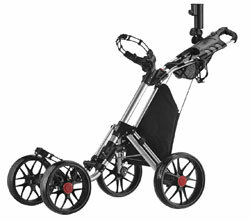 If you’re looking for an easy way to transport your gear from one hole to the next, a golf push cart is the way to go. Golf push carts make moving heavy gear a cinch. Whether you have a designated caddie with you or you plan on taking advantage of the healthy exercise yourself, push golf carts are easy to use and incredibly useful. A range of different styles is available, allowing golfers to find an option that suits their playing style. If you play on a regular basis, carts are a worthy investment that will save you a lot of time and frustration. Here are 5 of the best golf push carts. This option from CaddyTek is excellent for both experienced and novice golfers. The light and easy-to-use design make it easy to operate in virtually any terrain. With a weight of just over 2 pounds and the ability to fold down, it’s easy to transport. Even with its lightweight, the cart is capable of carrying large bags filled to the brim with equipment. It has 3 wheels for stability. The 2 rear wheels measure 11 inches while the front wheel measures 8 inches. An efficient brake system makes the cart easy to control. Simply pushing the break will bring the cart to a stop and release the foot brake. With an umbrella holder, sizable pocket, and beverage holder, it’s a great piece of gear to have out on the course. 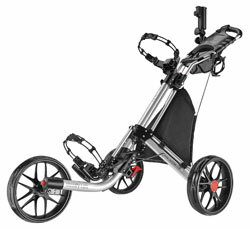 If you’re looking for something a bit more robust, the One-Click folding cart from CaddyTek is a great option. It weighs in at about 17 pounds and is made from durable aluminum. The four wheels provide ultimate stability. The rear wheels have a radius of 11.5 inches while the front wheels have a radius of 10.5 inches. All the wheels have a thickness of over 2 inches and have unique treads that provide ample traction in any terrain. 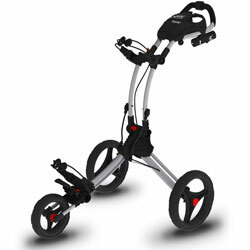 Despite the large frame, the golf push cart easily compacts with a simple push of a button. It folds down to a manageable size that fits into the trunk of a car. The brake system is also carefully designed for easy use. One push of the brake system stops the cart while another push releases the foot brake. Additional features like a built-in cooler and storage racks make it great for any serious golfer. 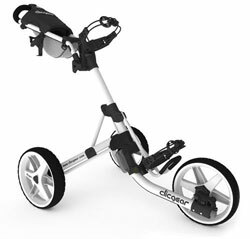 This golf push cart from Clicgear is carefully designed for versatility and ease of use. It’s made from aircraft grade aluminium tubing, ensuring that it can take a bit of wear and tear without worry. It’s a bit on the heavier side, weighing in at around 18 pounds. However, the cart is designed to break down for easy transport. It has three large and wide wheels, making it great for courses with rough terrain. A hand brake system gives you ultimate control. A simple pull of the brake handle will slow down the speed of the cart and act as the parking brake. It has a mesh pouch, umbrella holder, and bottle holder. The cart also comes in a variety of colors, allowing you to stay true to your style. The EZ-Fold from CaddyTek is a highly refined option that has a number of great features. It’s made from thick aluminum tubing, putting the weight of the cart at 18.5 pounds. It has 3 large wheels for control and stability. They have a radius of 11.5 inches and a thickness of 2.6 inches. They’re made from thick rubber, ensuring that they will last for many years without issues. A unique thing about this cart is that the wheels are all the same size. This creates a more stable cart that can maneuver easily through inclines and obstacles. The cart folds down to a compact size that is easy to transport. The EZ-Fold has the same one-click folding system as other models from CaddyTek. It also has a similar brake system that stops the cart with one push and releases the parking brake with another. This cart is very versatile. It has a modern design that allows you to add or take away bulk as you see fit. Made from thick aluminum tubing, the cart is durable. However, it folds down to only 13 by 15 by 24 inches in size. Three sizable wheels make the cart easy to manage. The tires are airless and virtually maintenance free. The front wheel even has a quick alignment system. A hand brake controls the speed and brings it to a stop with ease. A cup and umbrella holder are built into the cart. However, two additional accessory mounts are included. 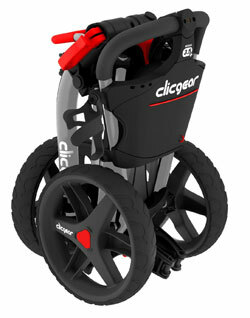 This allows you to attach optional Clicgear accessories to fully customize your golfing experience. This includes anything from a seat to a ball clip. 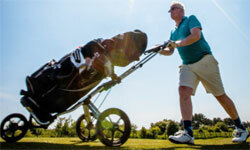 Before buying the first golf push cart you see, there are a number of things to consider. Not every cart is made the same. Many have useful features and styles of construction are available. You should choose a cart based on how you play, organize your gear, and the type of course you play on. It goes without saying that the quality of the wheels should be an important thing to consider. While small and thin wheels are great for smooth surfaces, you’re not always going to stick to the sidewalk. Courses with variable terrain require more robust wheels that can take a beating. Bigger wheels will get through any type of terrain and make the task of pushing much simpler. 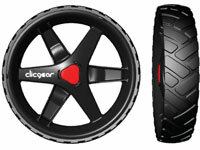 Wider rubber wheels with treads will get over debris and lessen any bounce that may occur. 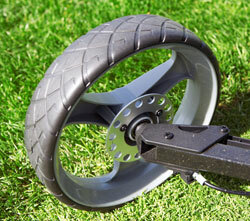 Wheels with a large radius will also even out bumps and dips on your path to the next hole. The biggest thing that differentiates golf push carts is the number of wheels. Pull carts usually only have 2 wheels while push carts have a third wheel that adds stability. This third wheel allows you to keep the entire cart parallel to the ground as you move. Some golf push carts even come with a fourth wheel, though that may make maneuvering around tight turns an issue. When looking for a push golf cart, you should take a look at the third wheel on the front. A more durable and versatile wheel will improve usability. A rotating front wheel makes steering the cart much easier, as it provides ultimate control during turns. As with any wheeled contraption, brakes are important. Most golf courses contain many inclines that could send your cart rolling. A parking brake will ensure that the push cart stays stationary as you make your next swing. Many carts include parking brakes on the rear wheels. If your regular course contains a number of inclines, a cabled brake may be a better option. As you make your way down a hill, the weight of your gear may cause you to lose control of the cart. Not only is this dangerous, but it could also damage your precious gear. Cabled breaks have controls located on the handle and allow you to limit your speed down inclines, much like a bike. Chances are, you’ll take more than your clubs with you to the course. It’s important to check the amount of storage a golf push cart has to ensure that you won’t have to carry an additional bag. Many carts have a pouch or pocket. Usually located just above the handles, the pockets provide ample room for small accessories. That being said, it should be noted that larger pockets will add extra bulk. Too much gear will weigh down your cart and make it more difficult to manage. A moderately sized pocket that easily collapses or folds will give you versatile storage space that you can use when you need it. Extra accessories and features can dramatically change how you play. 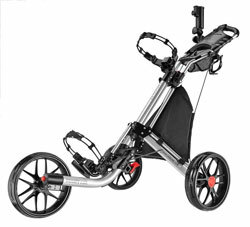 Many accessories are built into golf push carts while others can be added whenever you need them. While they will add extra bulk, they can be a great investment if they are needed. Collapsible seats are available to those who become fatigued while playing golf. They stay out of the way when you’re on the move but pop up when you need a breather. Bottle holders and coolers will keep you hydrated and energized on the course. Umbrellas will keep you shielded from the sun or rain as you play. 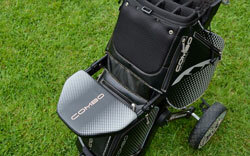 A range of accessories are available, allowing golfers to truly customize their cart. Most push golf carts are designed to collapse when not in use. This makes it easy to stow out of the way and transport to the golf course. The collapsed design should be considered, as some collapse easier than others. Many collapse into a small unit that can easily fit into any vehicle. However, others may be a bit bulkier in the collapsed position. Carts with numerous accessories, for example, don’t always collapse completely. Seats and large storage pockets get in the way, causing the cart to become cumbersome even in a collapsed position.